Anything smaller than a 4-inch square symbol (QR code) might not be readable by some smart phones. Our QR codes that you order will be 4-inches so that they can easily be read. 1-inch barcode equals about 1-foot scanning distance on most phones. Using a larger QR code will depend on the amout of space left on the medium used. For example, on a 6-inch high sign the 4-inch QR code will be the largest size that can be used because the code requires a white border to surround it in order to be read. Glares from the sun may cause difficulty for the code to be read. 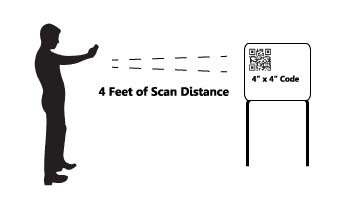 A 1-inch barcode equals about 1-foot scanning distance on most phones, which means QR codes on real estate or other signage can not be read from the street. We recommend that you use at least a 4-inch square symbol (QR Code) to allow for best readability when scanned.